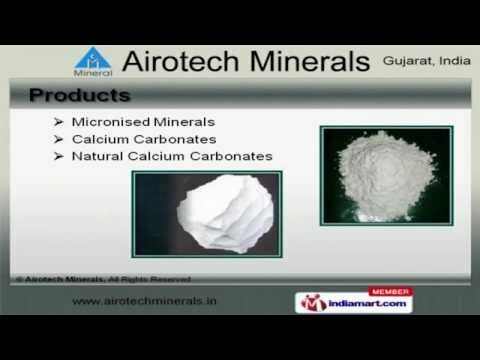 Welcome to Airotech Minerals, Manufacturer and Exporter of Micronised Minerals. The company was established in 1998 at Vadodara. Our Stringent quality checks and transparent business policy make us unique in the industry. International purity standards, industry leading prices and safe packaging make us the preferred supplier in the industry. We offer a diverse range of Micronised Minerals, Calcium and Natural Calcium Carbonates. We offer China Clays, Calcite Powders and Calcined Kaolin that are best in the industry amongst others. We are engaged in offering supreme quality Dolomite Powders, Calcite Minerals and Barium Sulphate. Our organization is highly involved in providing an impeccable range of Hydrated Magnesium Silicates and Magnesium Silicate Used as Talcum Powders. Our Calcium Carbonate for Paper and Rubber Industry are well known for their durability and reliability. We are instrumental in offering a high quality range of Calcium Carbonate for PVC Pipes and Masterbatch.